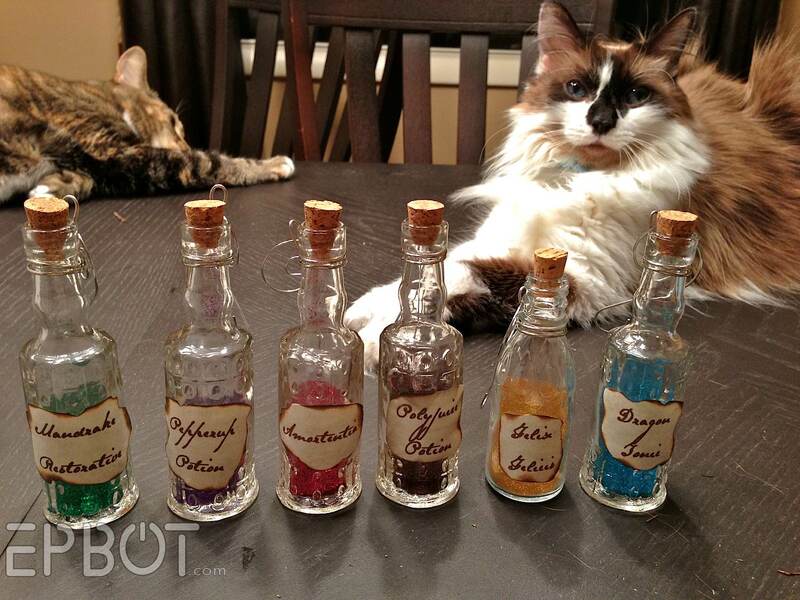 EPBOT: Final Potter Tree Reveal: Winged Keys, Potion Bottles, & Floating Quills! Dare I say it...I'm not a Harry Potter fan. BUT, I love your tree and really enjoy the tutorials and pictures! Thank you! Merry Christmas, Jen and John (thoJ). You've inspired me to do a themed tree... next year. But like you said, waiting has its advantages and I'll go get stuff on sale tomorrow! I LOVE IT!! 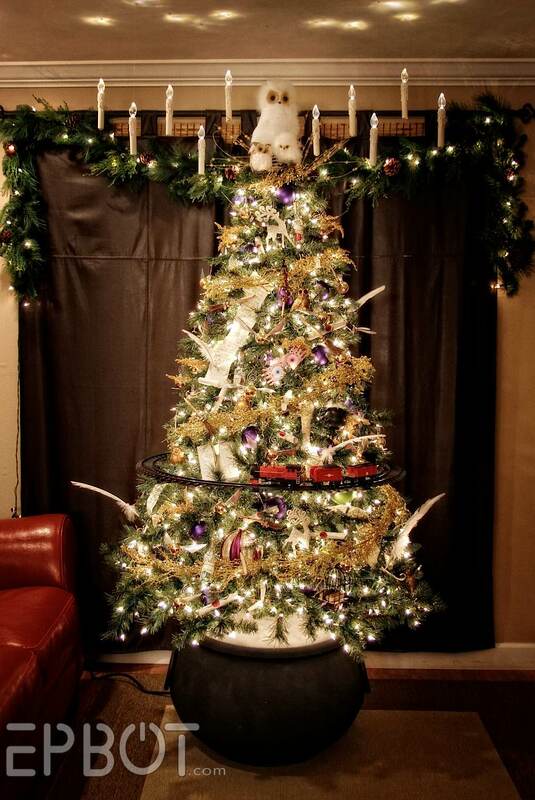 (Hope this doesn't post twice...) This makes me want to do my own themed tree, but I don't think I'm a big enough fan of any particular thing. I would really enjoy the challenge, though. I think I'd like to do a Middle Earth tree wrapped with a large paper-mache Smaug. I love this idea in theory and I'm certain I can do it, but I'm not sure about how it will work out in execution. Do you do all the calligraphy yourself or are you printing it from the computer. If you are printing it, what font are you using? 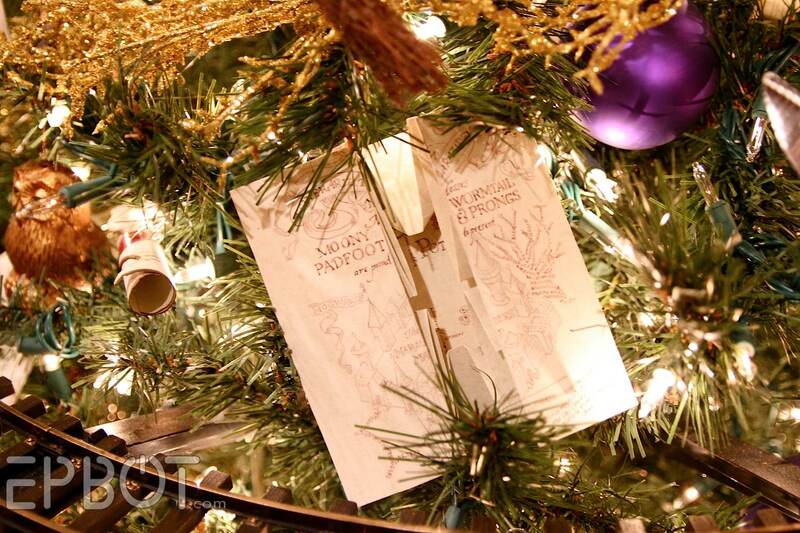 While I love the idea of a themed tree, with two small kids it's next to impossible. My younger son tore our tree down today. Luckily we use cheap plastic ornaments for exactly that reason, so nothing broke. Oh man, there's no way I could write that well! We printed everything using a font called Schoon, which is a fabulous handwritten script. It's the same one we used way back when for the apothecary drawer labels in our dining room. That is just so beautiful. wow. I'm glad you were willing to post in-progress photos, because it helped me appreciate the small details, instead of just being overwhelmed by the wonder of the final project. Fantastic! I am so jealous right now. I can't even express it. AMAZING. My almost-three year old daughter already loves fantasy and action movies, so we watched the entire Harry Potter series with her, which is my passion. Then, because my husband is a huge Tolkien fanboy (his wedding ring is the One Ring) we next watched Lord Of The Rings, but Juliet is convinced that everything is in the HP universe. When Galdalf was fighting the Balrog, Juliet exclaimed "look, Dumbledore is fighting a dragon!" I laughed, but I think Robert was crushed. We've decided that "Dumbledore and the Hobbits" is going to be the name of her garage band. I know! Why? Why must they mess with an awesome story line? I wouldn't let my girls watch the movies until we finished reading the books. I was disappointed with all of the movies, but the last book most of all. 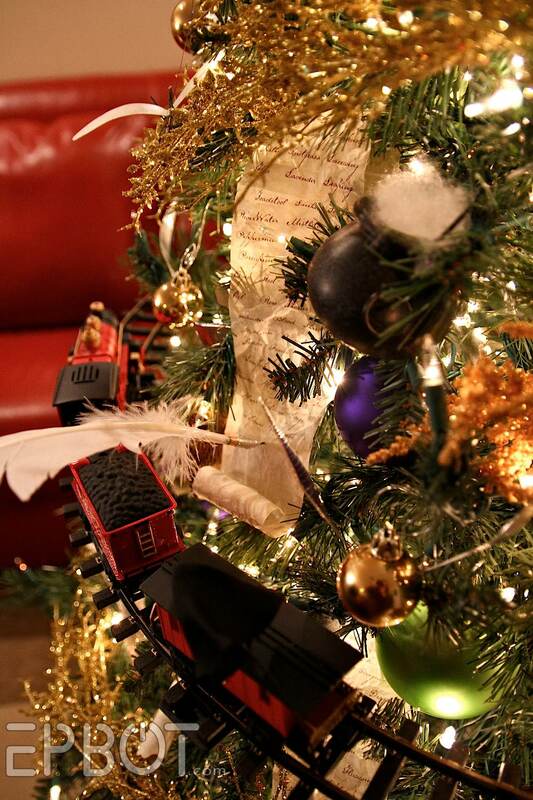 My Potter-obsessed 8-year-old wants to know if Harry's wand is somewhere on the tree. He didn't see it! We loved looking through this together! I think I'm going to make a marauder's map for his birthday! Sweet! And we actually have several wands we could use - including Harry's - but couldn't figure out how to display them properly in the tree! Since most are just brown wood, they won't really show up, you know? But I'm open to suggestions! Maybe in an Ollivander's box? 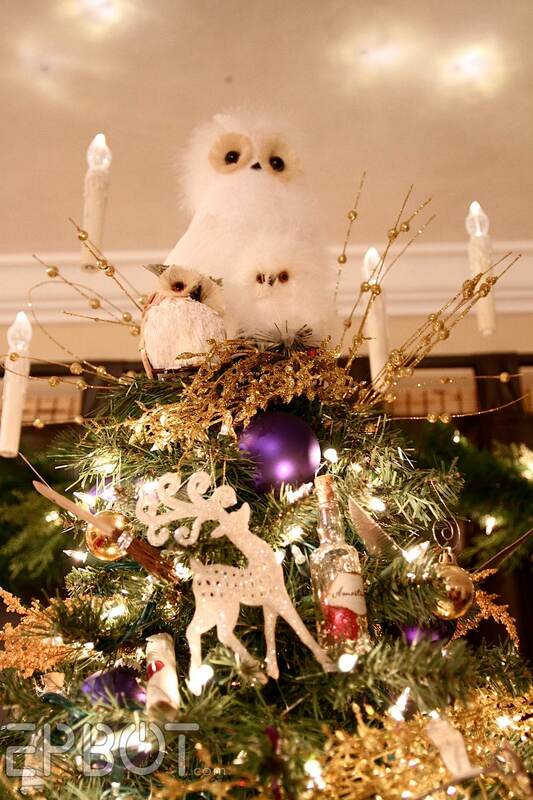 Ooh, what if you fanned out all the wands behind Hedwig to enhance the tree topper? Beautiful tree! 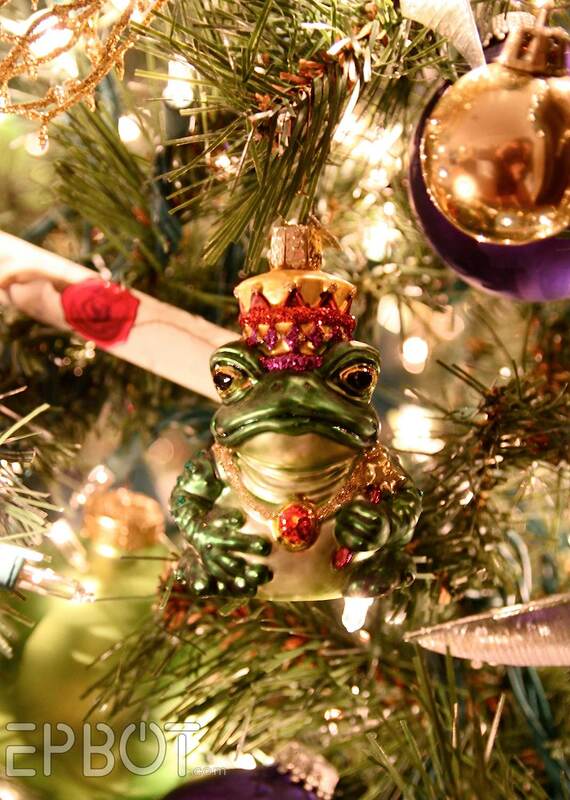 Love the frog. Merry Christmas John and Jen! I was totally singing "doo doooo do do doo dooo dooooooo doooo." (HP theme) while watching the video. Love how it turned out! Wow, this is amazing! Thanks for all the how-to and close-up shots so we can really see the details. Also, a tip for anyone worried about their cats/dogs/children knocking over their tree: tie it up! For years, we attached 2 fine wires from just below the top of the tree over to short nails set in the top of a nearby window frame. They were nearly invisible, yet did a perfect job of keeping the tree upright despite our large dog's wagging tail and our cat's attempts to make every ornament a toy. I would definitely tell people that the frog is named Trevor. I know Trevor is actually a toad, but I would tell them that anyway. 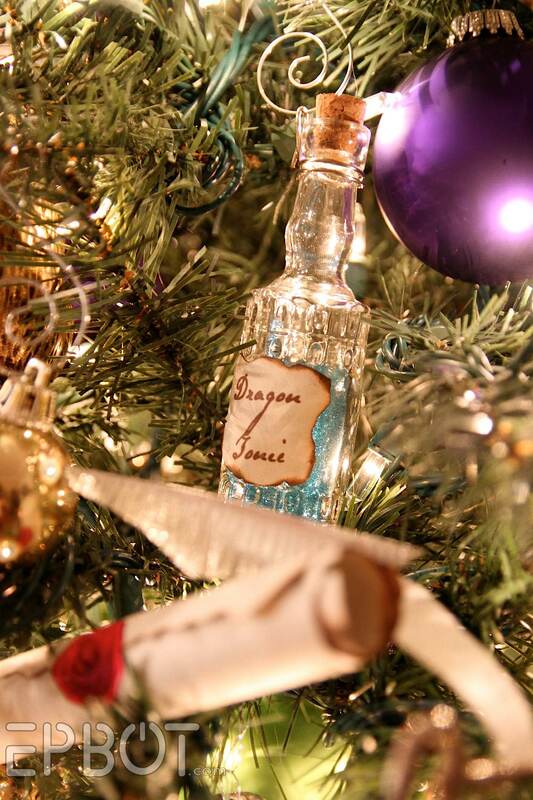 On another note, I love your potion bottles! Something about little colorful glass bottles is almost irresistible to me--I have a small collection, but most of them are a little large for Christmas ornaments. And I love the winged keys, too. I bet those would make great ornaments on a wreath, where they wouldn't be so easily swallowed by the sparkliness of the other decorations. Or a mobile, or a wind chime...the possibilities are endless. 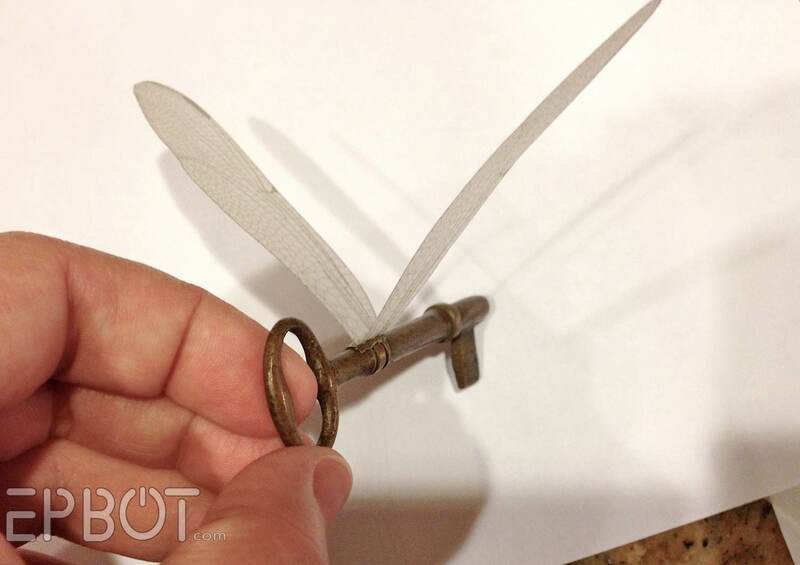 You can never have enough old keys around the house, in my humble opinion. That is absolutely awesome. Someday, I hope, I can manage something that fantastic. Merry Christmas to you and John! Absolutely fantastic! Thank you for the close ups. I feel so inspired! I usually do a different colored tree theme each year, and treat each Christmas tree as a craft project opportunity; but I bow to your excellence. I want to start now for next year's effort. 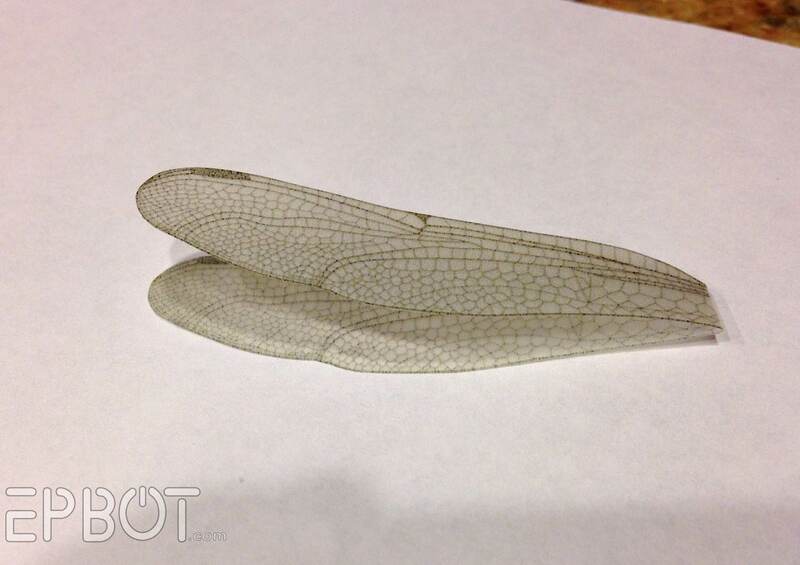 On the keys, maybe use a pearlescent spray on the wings to make them shimmer and catch the light. Man, I wish I were your friend, just so I could come see the tree!! It is great, I started rereading HP yesterday and this just made my day. Thank you for sharing. And thanks for all you do with Cake Wrecks, you bring a bit of happiness into people's lives everyday. Merry Christmas. It's so beautiful and dreamy and twinkly and pretty and shiny! Incredible! I think you have surpassed yourselves with this one. Mailbag post: I am super proud that you went, I am sorry you had some lows but you went that i think is the most important thing! I have been paruzing the posts on facebook and there is some awesome stuff (I tried posting some pictures from Precious Moments in Carthage Mo but i could never get them to post from my phone bummer). I love Christmas from beginning to end its my favorite so all of your trees and everyone elses just makes me fangirl squee. I adore this tree and am awed by all the fabulous work you put in on it. However, I have one question that has been bugging me - the purple balls. Do they represent anything or are they just there to add a bit of color to the tree? When I win or make my millions, the 1st thing I am doing after getting my loved ones set financially, is hiring a 'lifestyle creative consultant'. I LOVE this tree, and much of your decor, but I did not get that gene, so I would not even know how to begin half of these projects. 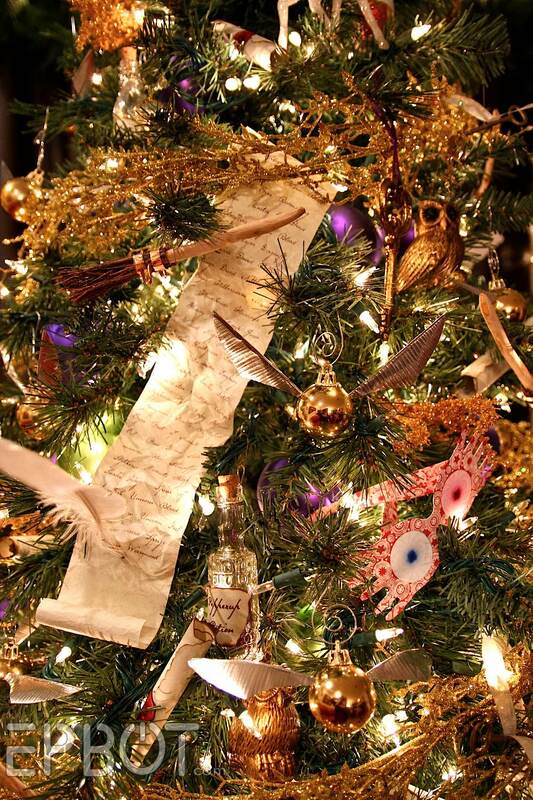 The tree is wonderful, I love the theme and the execution. You guys really do rock! So freakin' cool! As always :-) I do think the dementor should be wearing a tiny Santa hat. And maybe add a Hungarian Horntail or Norwegian Ridgeback? 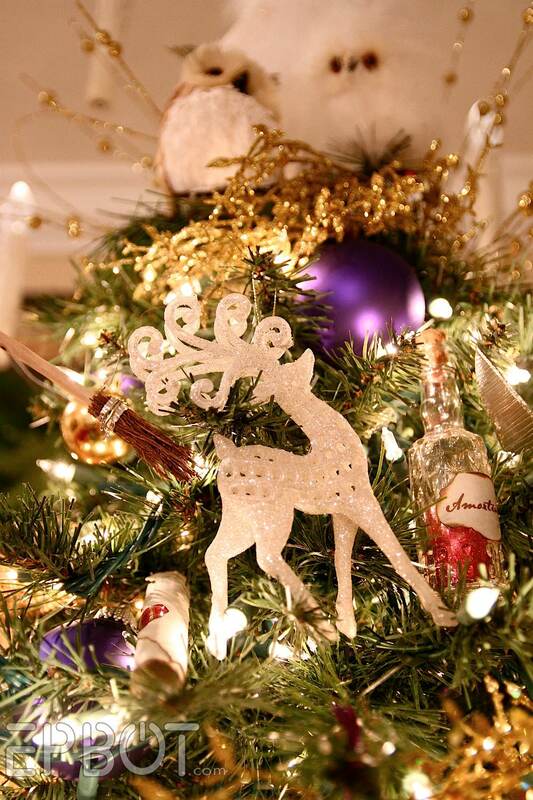 As for the wand, suspend it (or wire it look suspended) a bit out from the tree at the bottom, and have your magical Cindarella swirl garland emanating from the tip! 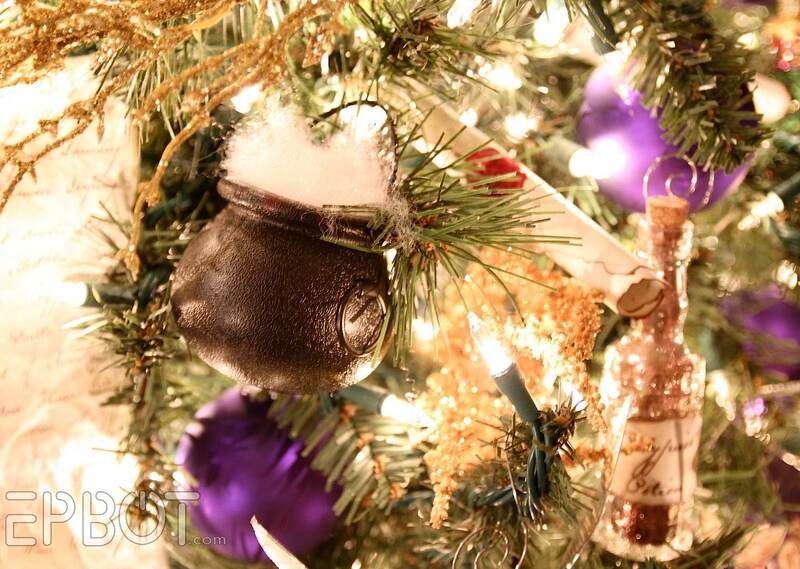 Because of course, a wizard's tree would be decorated using magic! 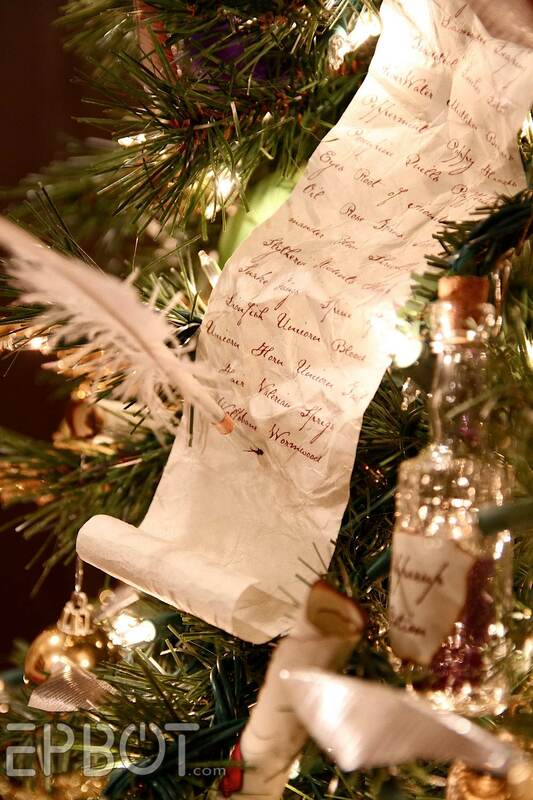 Love, love, love the tree! 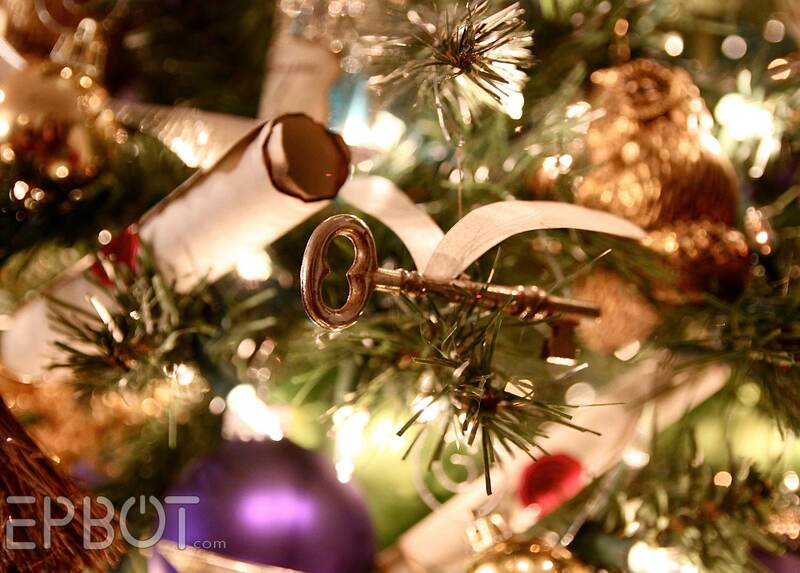 Perhaps use the same hanging method for the keys as the floating candles, so they float above the tree proper? I also agree with Kristen about using some translucent color. Cheers, and happy holidays! Really terrific tree, Jen and John (thoj). What nice work, that the rest of us get to oogle and aaahhhh over. incredible details, Jen! I especially love the scrolls (and I think that's a great idea to position them mid-word). This is fantastic! I want to live in the tree! This tree makes me SO SO happy! I will be back to peek at it all year long! What are the requirements for entering in the tree display you post pictures of. This should be in it next year! 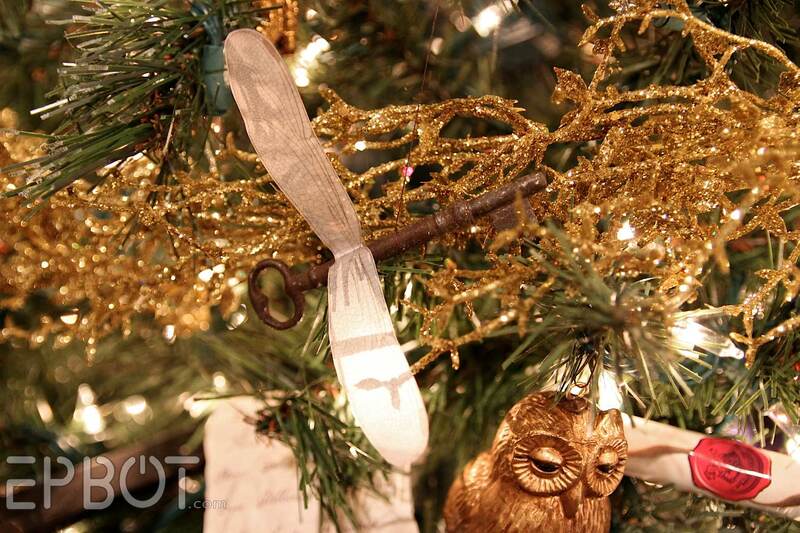 The winged keys are perfect. 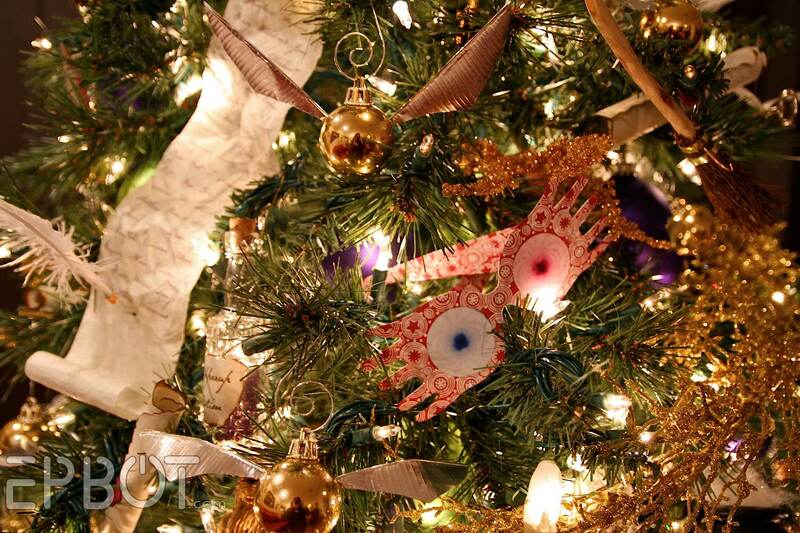 I can see how some of the detail is lost with the lights, but by not being super glittery they add depth to the tree and the drape of the wings is exactly right. They look like they are flying. An alternative explanation for the frog - paint the crown pink and paint a pink sweater and you have Dolores Umbridge. Ok, time to look at the tree again! Have to say - saw your tutorial on the train and had to Google to find Christmas Tree trains. Found one at Home Depot and we were able to retrofit into our live tree! YAY! I would have never seen this without your post! I have to say - looking at the train how impressed I am with your reconstruction but have to ask - HOW did you manage to remove the "sound effects"? Congratulations on a fabulous tree! I love the tree. I am a huge HP fan - I've never listened to the Jim Dale books though - it's Stephen Fry for me (British version)! Thank you a thousand times over for being my inspiration. My living room is the Ravenclaw common room and I have fantastic gold couches I call golden snitches This is my first year on my own in a new town where I know next to no one and I bought a little, undecorated tree and figured lights and garland would do. Then I saw your snitch tutorial and had to have at it. So easy and fun to make, if a bit time consuming! Worth every bit! I gave one to my boss too and he absolutely loved it! I also added some wands I made into the fray too! If you go to my journal, I made a post in your honor! I have a hunch that this will be a blog I now closely follow for future nerdy needs! Thanks so much again for sharing your brilliance with us all! I'm late to the party, but this is just AMAZING!!! 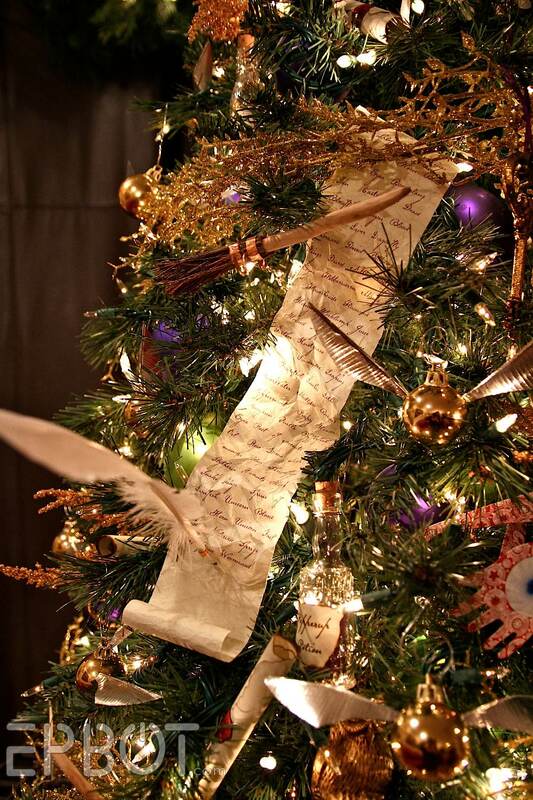 So fun to see this, I adore HP and this tree makes me kind of misty! Sensational! I love the potions bottles the most. And I just love that one doesn't have to spend a lot of money to make something so incredibly wonderful, far batter than what money could buy. Gorgeous! 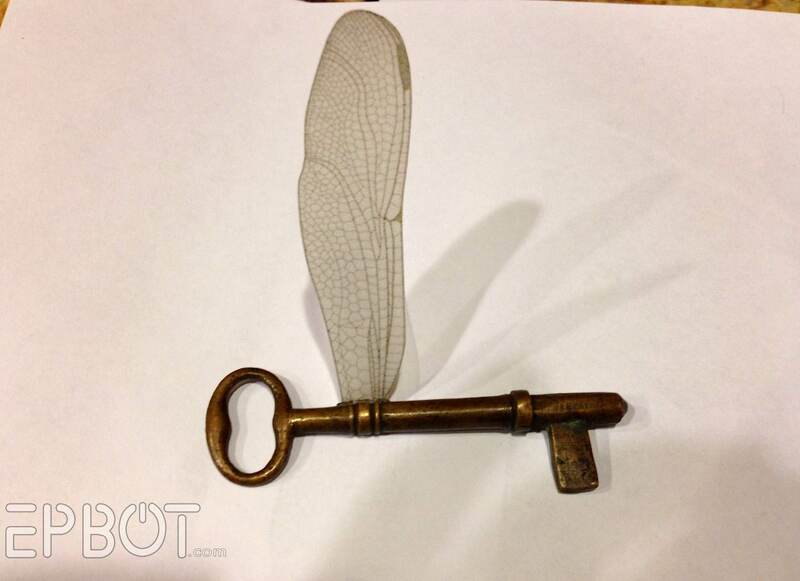 Maybe trace over the veins on the winged keys with glitter embossing powder? We've been rewatching the movies and I've been re-reading the later books over the Christmas break, and I am much less annoyed by the changes that were made than I was the first time around. They left out some of my favourite bits (Dudley's redemptive moment, Kreacher's horcrux story and change of heart) but mostly they did a really good job on cutting down a very complex story to make it intelligible by people who haven't necessarily read the books. 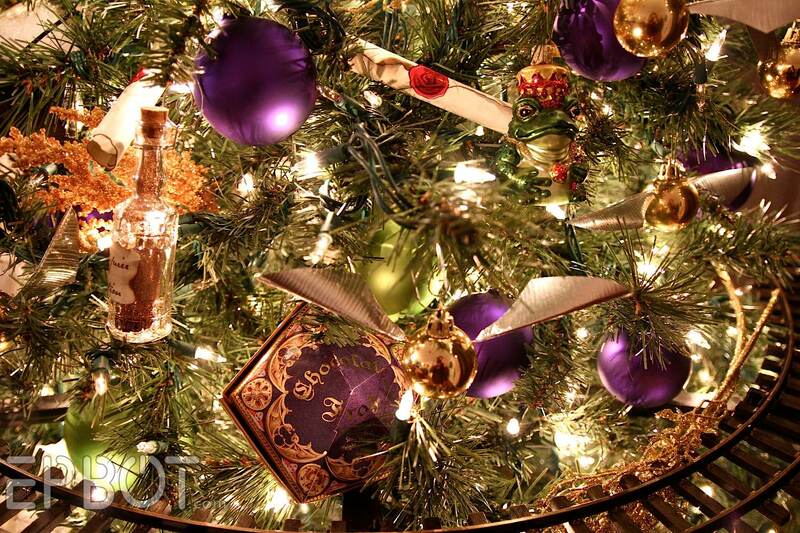 Such a magical Christmas tree! How do you keep the cats from wrecking it? Mine treat it like a jungle gym and eat the tinsel, so we don't usually put it up. This tree is amazing! And I would happily read a guest rant (I mean post) by John describing everything wrong with the later HP movies!! Love the burnt finish on the potion bottles! if you want to go even further, maybe try spraying the parchment with a little bit of tea (You can use tea from mix or tea from grounds, it doesn't matter.) My daughter had to write a letter for school that was supposed to look like it was from the Holocaust, so she and I decided to go one step further and 'age' it by burning it and spraying it with tea. All-in-all, I wish I lived next to you so I could see this all the time! Can you please share how you accomplished Luna's Spectrespec glasses? I just love this tree. Hoping to try my own this coming Christmas. 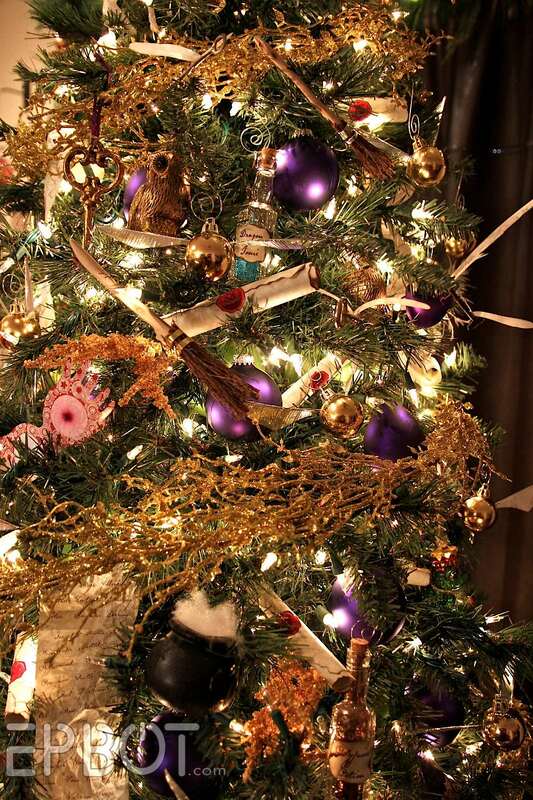 Hi jen i love your harry potter Christmas tree. 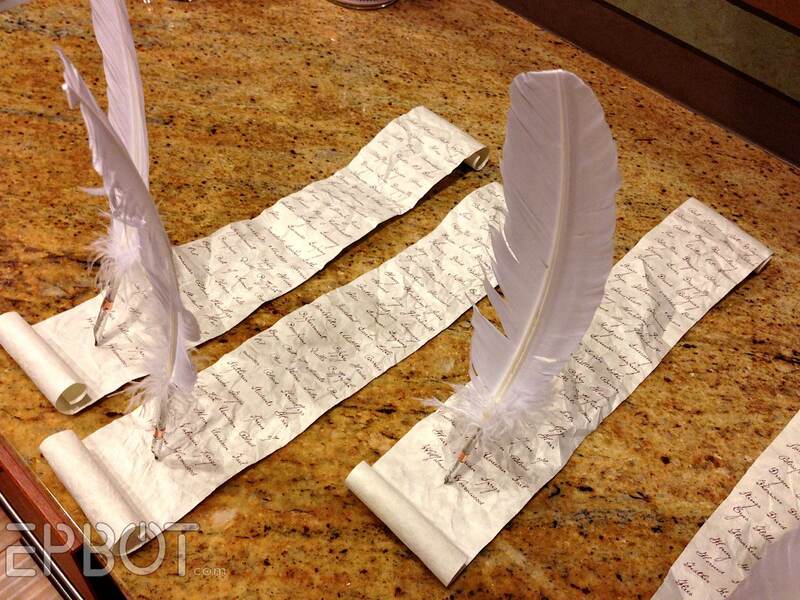 im doing this idea this year but i will like to know where did you got the floating quill pen? 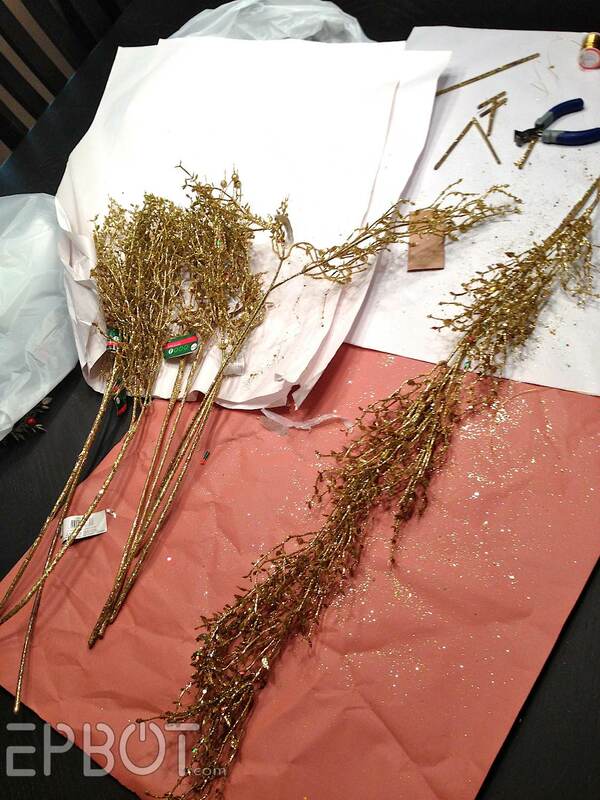 The quills are just craft feathers with a bit of metal tape wrapped around the tips. Easy peasy!